Ecclefechan tarts, named after the wee village, known as Fechan by the locals, in Dumfries and Galloway near the border of Scotland and England is a wonderfully rich treat for dessert or can be eaten anytime as a snack. We at Scottish Recipes like ours warm with cream or custard though they can also be eaten cold. They are sometimes nicknamed border tart. 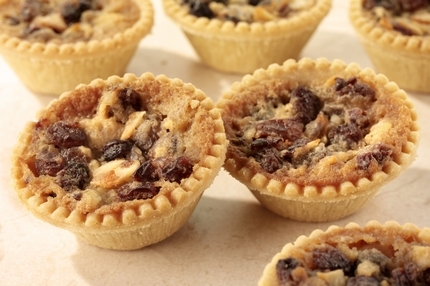 The ingredients of Ecclefechan tarts for a typical recipe contain almonds, butter, cinnamon, currants, cherries, dark muscovado sugar, lemon peel, raisins and unusually vinegar. These are then encased in deep lined pastry but with no top. It is a rich taste, often described as a mixture of treacle, pecan pie and mince pies. In 2007 Sainsbury's advertised them as a Christmas alternative treat and sales soared. The fillings bind together to give a really chewy delight. They can be made as small individual or a larger tart and can be pre-made and reheated later in the oven for about ten minutes or microwaved for about 20 seconds. Sadly we can never master the art of pastry so if you would like to share your Ecclefechan tarts recipe then please get in touch!